Adding to the woes of the proposed Halliburton/Baker Hughes merger, the EU has now launched a probe. What does this mean for investors? If it's not one thing, it's another for Halliburton (NYSE: HAL). Not only is the price of oil wreaking havoc on their customers, but the U.S. Justice Department is also holding up its proposed acquisition of rival Baker Hughes (NYSE: BHI) over antitrust concerns. Now the European Union has also joined the fray by launching a probe into the deal. This might seem like a minor speed bump compared with some of the roadblocks the merger is facing, but it couldn't come at a worse time. Beyond the efficiencies of scale that the acquisition would generate, the companies have complementary product lines and global footprints. The sale was expected to close in the second half of 2015. And then Uncle Sam got involved. But in the last year, the deadline for closing the deal has been pushed back three times. It's now set for April -- but don't hold your breath, because the Justice Department isn't commenting on what the companies could do to satisfy its antitrust concerns.In late September, Halliburton offered a cornucopia of businesses and business units for sale and offered to sell even more if needed. But all its efforts seem to have fallen on deaf ears. Halliburton is desperate to get this deal done, because if it falls through, it will owe Baker Hughes a $3.5 billion breakup fee, which it would have to take on debt to afford. Baker Hughes investors stand to benefit from the deal, too. The company is the smallest of the top three and thus currently at a competitive disadvantage. The deal also offers shareholders a premium for their stock. But there doesn't appear to be any light at the end of the tunnel, because now Europe is involved. So it's hardly surprising that Europe wants to launch a more thorough probe, which could last well into May. Naturally, this relieves pressure on the Justice Department to move quickly: no point in rushing if the deal is being held up in Europe! But the pressure only increases for Halliburton as its April 30 deadline edges closer and closer. Halliburton and Baker Hughes have tried to put a positive spin on the enhanced EU review: "a normal step in the ... process." ("We mean it! Nothin' to see here, folks!") But they have to be getting worried at this point. And even if the EU does eventually approve a plan, the companies' US market share is much greater, meaning the scrutiny is also likely to be much greater. An extended EU review is a harbinger of an extended U.S. review. Meanwhile, oil prices continue to slide and smaller oil services companies are beginning to fold. While this might be a silver lining for the companies' sales departments, it's not good for the prospective merger. Every time a smaller competitor closes up shop, it results in Halliburton and Baker Hughes commanding a higher overall market share. For example, Halliburton and Baker Hughes controlled a combined 47% of the global market in well completion equipment in November 2014, when the merger was announced. Today they control 52% of said market, according to industry consultant Spears & Associates. This creates a vicious spiral: the larger the companies' market shares, the less inclined regulators will be to approve the deal without significant concessions. Concessions which take time to formulate, propose, and review. Meanwhile, their market share continues to increase. And 'round again we go. The lack of a swift regulatory ruling by the EU means the process will drag on further, increasing the likelihood that the companies will be forced to either make extraordinary concessions or call the whole thing off. Neither is good for Halliburton or Baker Hughes investors. Ultimately, Halliburton and Baker Hughes want to do whatever it takes to make the sale go through. However, it's unclear if they will gain much advantage. If regulators force the companies to sell off too many parts, the combined company won't have much larger a market share than when it began the merger talks. And, depending on who's buying, they may create new competitors. As if that's not enough, the weak energy markets are a threat regardless of whether the deal goes through. Buying either company now would be a risky proposition indeed. Even big dog Schlumberger is going to be hurting as long as oil prices remain low. Things aren't pretty in oil services in general these days. 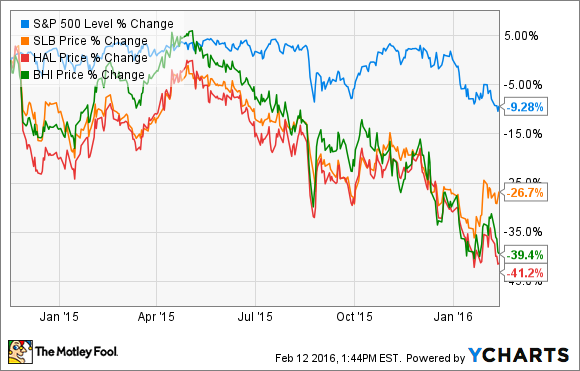 For Halliburton and Baker Hughes, though, they're getting downright ugly.